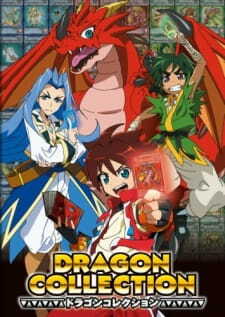 Through an unexpected turn of events, an ordinary elementary school student, Hiro Enryuu, finds himself in the world of the "Dragon Collection" game. This is a world called Dragon Earth, where gods, humans, and monsters exist side by side. Those who roam this world using a magic book, called a Grimoire, and cards to summon monsters and search for treasures that bear the powers of dragons are called Dracolle Battlers. Despite his bewilderment, Hiro becomes a Dracolle Battler and, together with the friends he meets there, begins his adventure to become a legendary Dragon Master! "Dragon Collection ~ Yuuki no Tsubasa~ (ドラゴンコレクション～勇気のツバサ～)" by Nagareda Project (流田Project)"
The anime is one of adventure and traveling with friends to gain strength. Throughout the anime, a sort of comforting feel is developed due to the characters that act and appear like little kids. The feel is also advanced a bit more through the use of comedy most of the time and haveing a positive outlook on all situations. I personally do not like the kid like atmosphere much, but it will for sure appeal to younger audiences. the anime is also one great to pass the time and just enjoy a fantasy adventure show, like other animes that have similar feels to them. The show is subbed and the has a good “complete” ending; however, if your like me then the ending will leave you wanting more since it combines a bit of sad emotions with excitement and fun. It is a video game based anime so if you like shows like dragons and puzzles then you will like this (basically the same feel).